Looking for string, shoelace, lanyard, or paper bags rope supplier? You have come to the right place. KIM BRAIDED CORD INDUSTRIES is the manufacturer of string, shoelace, mountain ropes, flat braided elastic cord, garment apparel draw string, bungee cord, lanyard, security ropes and paper bag ropes for whole Malaysia. 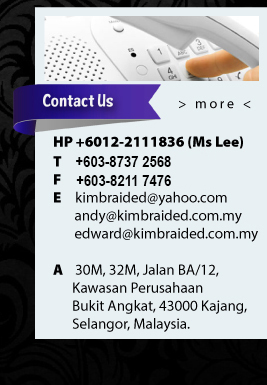 Our company is located in Kajang, Selangor. Our products are manufactured by using supreme quality raw material and highly sophisticated techniques. It comes in different sizes, colors, patterns, and designs.